The cost overruns at the new National Children’s Hospital, currently the subject of two separate investigations by the Oireachtas health committee and the Dáil public accounts committee, are likely to have ramifications for wider infrastructure development plans. Speaking recently, Taoiseach Leo Varadkar labelled as “scandalous” the significant difference between some government agencies estimation of the total cost of the project and the now established €1.433 billion, €450 million more than originally planned. While the project has had its political ramifications, including a motion of no confidence in the Health Minister Simon Harris TD, over accusations he deliberately misled the Dáil by not disclosing the cost overrun at an earlier stage, its main ramifications could still emerge in the form of constraints to planned major infrastructure projects within the National Development Plan (NDP). It’s estimated that around €100 million will need to be found this financial year to pay for the overrun, with likely changes between now and the new scheduled opening date of 2023. Any delay to the project will have ramifications considering the current upward trend of construction and material costs, especially labour costs. It may also add delay to other planned significant projects such as housing, roads and education infrastructure, pushing further costs on to the public purse. In health alone there has been €10.9 billion earmarked for the sector under the NDP, including high-profile capital projects such as the construction of primary care centres and new elective-only hospitals, as well as a series of initiatives linked to reforms under the Sláintecare plan. 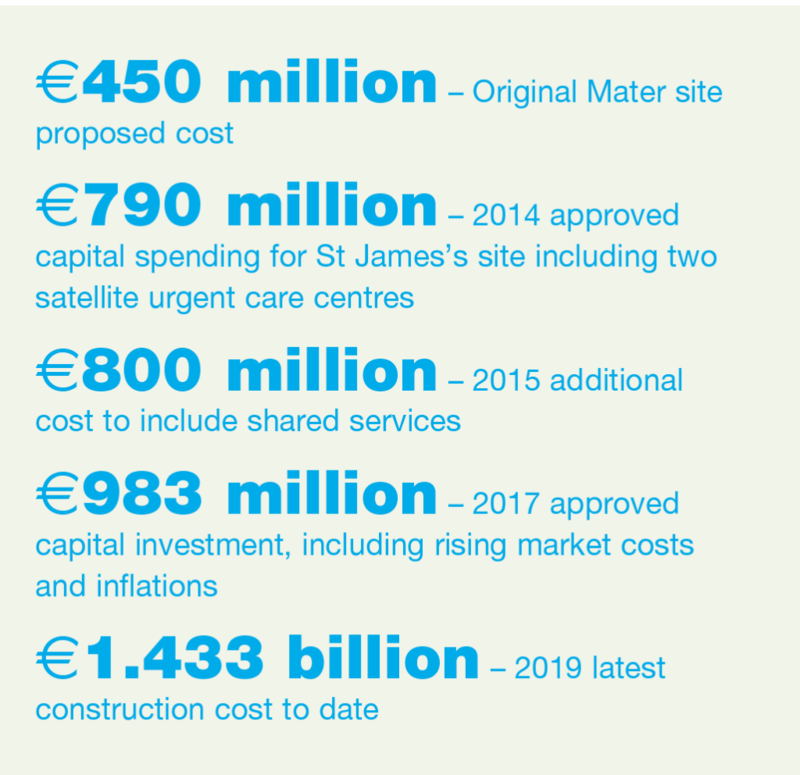 Whether the National Children’s Hospital overspend will have any constraining financial impact on delivery of these projects remains to be seen but undoubtedly the Government will be forced to alter its approach to large capital investments to ensure mistakes aren’t repeated. Expenditure on the new National Children’s Hospital can be traced as far back as 1993 when the Royal College of Physicians first proposed a single, tertiary children’s hospital to be built on an adult hospital site. A McKinsey report in 2006, which recommended the merger of three existing children’s hospitals into one unit, led to the Government’s endorsement of the Mater campus and the establishment of the National Paediatric Hospital Development Board (NPHDB). In 2019, Tom Costello would become the third chair of the board to resign. Before that however, two other chairs would resign, in 2010 and 2011, before planning permission for the site was refused in 2012. At the time it was estimated that some €35 million had been spent. After review of the issue then Health Minister James Reilly announced St James’s Hospital as the new site. Planning application was lodged in 2015, with an estimated cost for the project of €790 million and a completion schedule of 2020. Planning permission was granted in 2016 and in 2017 the Government approved a construction budget of €983 million. By August the NPHDB was informed that costs had risen by €200 million and by December this was up to €1.43 billion. Despite the over-run, the Government has opted to continue with the project, recognising the economic and social fall out of not doing so, not least the some 2,000 construction jobs linked to the project. On the back of the political fallout, BAM, the contractor responsible for the project, offered to opt-out if the NPHDB decided it should and said that it will engage with the PwC review. The review is expected to take up to six months but will not have power to sanction individuals. Minister Harris has previously said the inquiry would also look at ways to reduce costs but that he would not allow the project to be halted. Speaking to Newstalk radio he stated that re-tendering the contract for the project would only add delay and reaffirmed his commitment to delivering it. “The only scandal in relation to this would have been the decision to cancel the project,” he said. “Was this a situation where, being quite frank, it was always going to cost more than it was estimated? Were we let down by advice? Where did that go wrong? We will get to the bottom of that. Where to next for infrastructure in 2019? Ireland 2040: Will it be implemented, and does it go far enough?